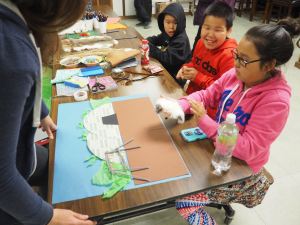 The Yup’ik Culture Fest Workshops in Quinhagak took place August 6-11, run by the Nunalleq Culture and Archaeology Center. For the past week, we have been going around town and observing the different workshop stations. 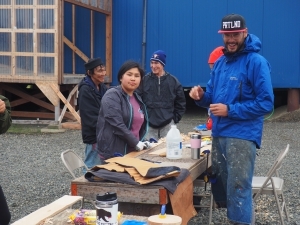 Before the grand opening of the Nunalleq Culture and Archaeology Center, different workshops were held for the community. 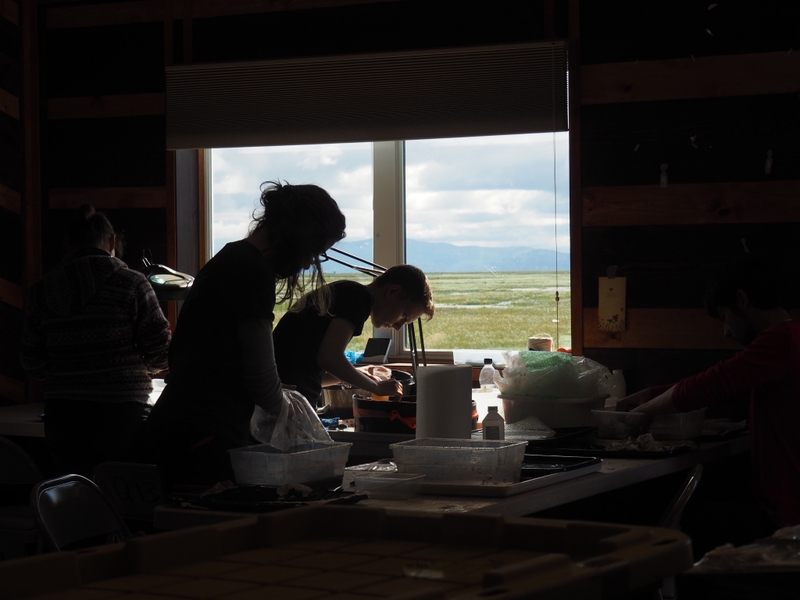 They all had some type of connection to the Nunalleq site and gave participants a sense of connection to their culture. 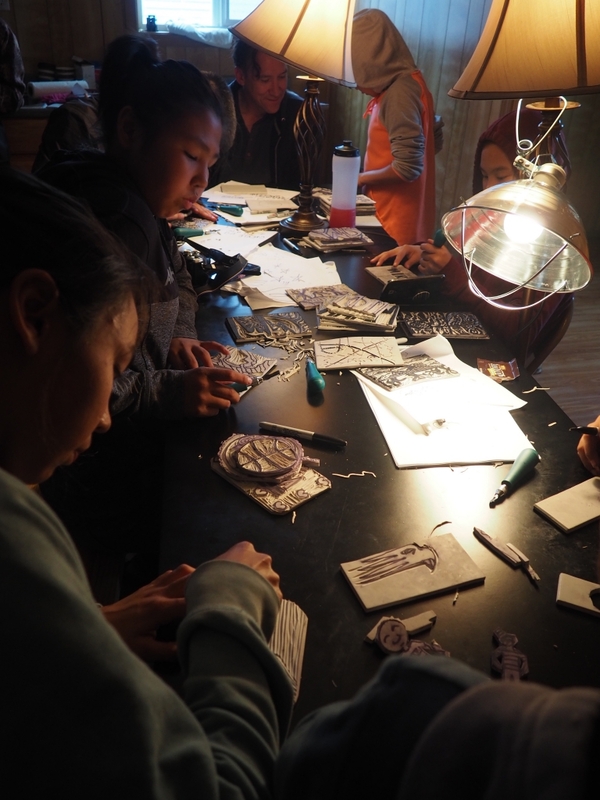 A total of nine workshops were held in the six days leading up to the grand opening: ivory carving, uluaq making, relief carving, bentwood steaming, skin sewing, stop motion story telling, mask making, music and dance with Pamyua and Emily Johnson, and dance group meetings for the new Eskimo dance song. In the ivory carving workshop, the instructor John Smith, a local ivory carver, taught the participants about carving and guided them through their carving. Students made crosses, seal figurines, and rings while gaining knowledge about the Yup’ik culture. He told them about when he was a young boy and when he first started ivory carving. While running errands for his mom, he’d stop by the qasgiq, a place where men gathered and where young boys gained skills and knowledge through stories and guidance from the older men. He said that he learned by observing what they were doing and by listening to what they had to say. 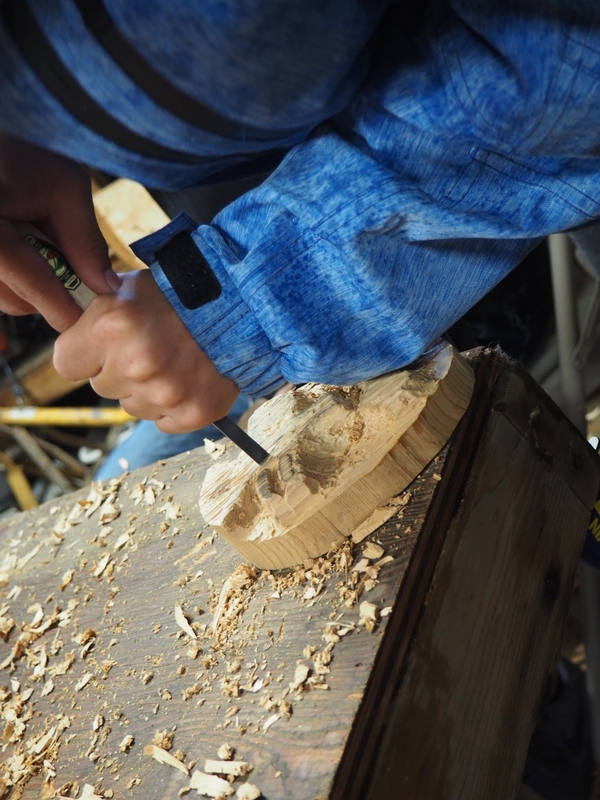 He also said that he would go outside, pick up a random piece of wood and start carving. Through that story, he told his students that we all have a talent; we just have to get off of our butts and learn how to utilize that talent. To wrap it all up, he stated that he is amazed by how our ancestors handcrafted everything without fancy technology we have today. The uluaq-making workshop with Willard Church started off with an introduction to the different kinds and styles of uluaqs (women’s knives). He displayed his collection of uluaqs that he had and explained how the uses of the uluaq affect the style and the performance of the uluaq. 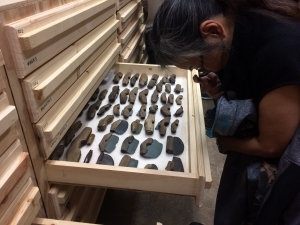 Willard expressed that it is important to think about what the maker prefers, who the uluaq is for, and what the uluaq will be cutting before designing your uluaq because uluaqs come in all shapes and sizes. On the second day of the workshop, the participants began creating their own uluaqs. 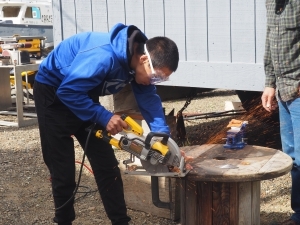 Willard gave step-by-step instructions and showed students the safest way to create an uluaq. The materials that they used included saw blades, ivory, walrus bones, and pieces of antlers from caribou or moose. Relief carving participants learned to write backwards for their projects they had to write in bubble form also because they need to create spaces. Ryan Romer gave his students a marker and told them to create a box and write their names in bubble form. Once doing that he told them to write another box and do the same thing except backwards. Once they did that and some added little designs in there it was off to the carving, they used these rubber box matrixes and re-wrote their backward bubble name. 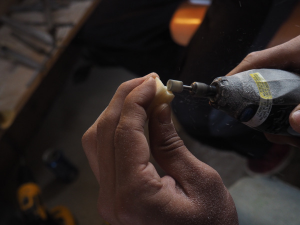 Once their finish, they start carving out the non-needed parts of their matrix and making their designs. Ryan gets the paint out and rolling-paint brush and puts paint on the matrix over and over again until it shines. Then that’s where the fun part begins, that’s when they begin printing their designs on their own shirts. Bentwood steaming had a weird start because of the weather patterns that have been going on around here, they had to steam their woods on the first day and they were done. Just kidding, the next day is when all the fun stuff started happening. The students were shaving off their wood piece to thin it out. Drew Michael who was in charge of the students wanted to recreate the artifacts that were found at the dig site. Once they shave off their pieces of wood that’s when they start the bending process, they also had to make a base for their bent piece. The only part that takes the longest is the bending process; the process will have to be repeated couple times for their bend wood to fit around the base. 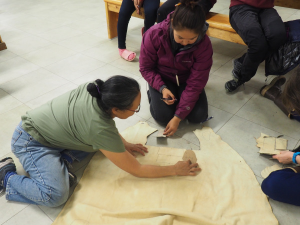 The participants who were part of the sewing group were closely and carefully sewing their sealskin pieces together while being guided by Sarah Brown. They also used different types of fur when making their sealskin project. They had to put wax on their thread when joining their pieces together because of rough the hides were. Sealskin making is a well-known craft that’s been living throughout our generations. Can create any regalia and any thing, but it takes a lot of time and effort to create really nice outfits and miscellaneous knickknacks. Skin sewing is an important cultural activity that young participants can learn because our ancestors sewn together everything they wore before we got technology, they sewn everything they had and made everything by their own hands which is amazing. The participants who signed up for the stop-motion animation workshop was working on their storyboard about the bow and arrow wars. They used the materials they have to create the part where the village of Qanirtuuq to attack the village of Arolik. Alice, who was working with the participants, was teaching the participants to record and take pictures for the artwork they created. The participants were being creative when working on their art for different key scenes that happened before, during, and after the attack. The participants also put in their own voices when creating the project, some adults came to help here and there and it was a history piece but made by stop motion. Ben Charles works on his mask. Mike McIntyre was the instructor for the mask-making workshop. 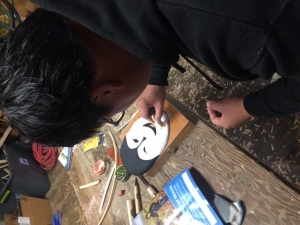 When the participants arrived to the workshop they were given an oval piece of wood as the base of the mask. After a brief demonstration of the different kind of masks, he handed everyone a carving tool to begin their mask. He gave the participants the creative freedom to design and carve what he or she wanted. The first day resulted in many of the participants receiving minor injuries. This demonstrated that carving is a difficult art form that our ancestors mastered. On the last days of the workshops, Pamyua set up their music jam session at the armory. Pamyua is a well-known music group who takes yuraq songs and combines them with modern instruments. The Pamyua artists who came were Phillip and Ivan, they also collaborated with a contemporary Eskimo dancer, Emily Johnson who came from New York. At the session, the participants learned to freely express themselves through music and dance. Pamyua used one of Quinhagak’s yuraq songs, the song about our river called Qanirtuuq Upnerkami. Using the yuraq song as a basis, they modernized and adapted it into a louder and more free-flowing yuraq song where the participants were invited to dance and sing with their whole being. The music and dance workshop was sponsored with a Community Arts Development Grant from Alaska State Council on the Arts. 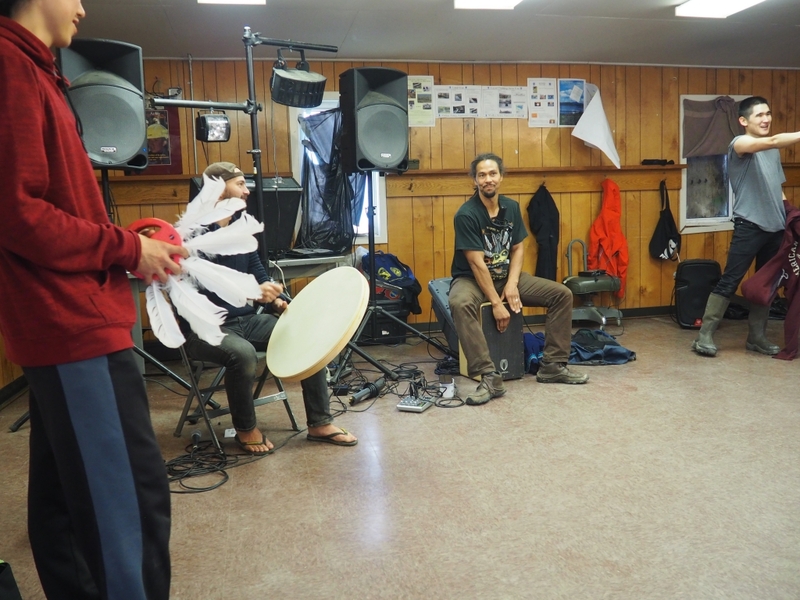 A renowned dancer, Chuna McIntyre from Eek, met with Kuinerrarmiut Yurartait (the yuraq dancers of Quinhagak) for two days where he taught the dancers two songs and the basics of yuraq. He also showed them the traditional regalia for men and women and explained to us what each part of the outfit meant and symbolized. One of the songs Chuna McIntyre shared was a special song passed down to him from his grandmother. He said that when his grandmother was a little girl she lived at the old village of Arolik where she heard a song that stuck with her. The lyrics of the song are, “Thank you for my labrets, thank you for the ones before us, thank you for my septum piercing decorations and my long beautiful necklaces.” The two songs he shared were used in the performance at the opening celebration of the culture center. Above photos courtesy of Nadia Sethi, TCF Program Officer. 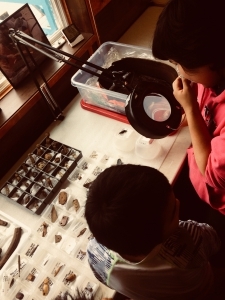 The archaeologists working in the lab have also been really busy as they clean the finds and prepare for a huge event that’s coming up; the opening of the culture center museum. Last week the artifacts finally arrived back home after being studied at the University of Aberdeen. They are going to be put in the culture center for our people the future generations, and everyone all around to see and learn about our culture. The artifacts that were found at the Nunalleq dig site, just say this, biggest collection ever found. 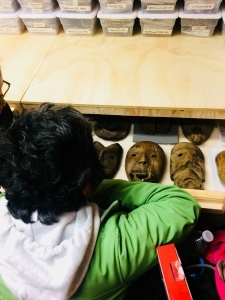 The men, who work at the Qanirtuuq Inc. had to make large drawers so that the artifacts can be put and be displayed that way.